The Warriors' star point guard took to The Players' Tribune Saturday on Veterans Day to open up on the perception of himself and many others "disrespecting the military." Thom Jensen reports. Stephen Curry has about as big of a platform as one can have. And he's ready to use it. The Warriors' star point guard took to The Players' Tribune Saturday on Veterans Day to open up on the perception of himself and many others "disrespecting the military." The 29-year-old takes these allegations very seriously and wants people to understand the truth of the matter. But when someone tells me that my stances, or athlete stances in general, are "disrespecting the military" - which has become a popular thing to accuse peaceful protestors of - it's something that I'm going to take very, very seriously. One of the beliefs that I hold most dear is how proud I am to be an American - and how incredibly thankful I am for our troops. I know how fortunate I am to live in this country, and to do what I do for a living, and to raise my daughters in peace and prosperity. But I also hear from plenty of people who don't have it nearly as good as I do. Plenty of people who are genuinely struggling in this country. Especially our veterans. Curry has even spoken to veterans about silent protests such as Colin Kaepernick taking a knee during the national anthem. He's even explained his reasoning for peacefully saying he did not desire to visit the White House with Donald Trump as President. Every single veteran I've spoken to, they've all said pretty much the exact same thing: That this conversation we've started to have in the world of sports … whether it's been Colin kneeling, or entire NFL teams finding their own ways to show unity, or me saying that I didn't want to go to the White House - it's the opposite of disrespectful to them. A lot of them have said, that even if they don't totally agree with every position of every person, this is exactly the thing that they fought to preserve: the freedom of every American to express our struggles, our fears, our frustrations, and our dreams for a more equal society. In the article, Curry reveals he recently met a man named Michael at his wife Ayesha's restaurant opening. Michael served in Afghanistan and the two spoke on all the issues the veterans face. Curry wants more than just thanking troops, he wants real action and is calling for all of us to do better. We hear all the time on TV and social media about "supporting our troops." But it's not just about saluting them or thanking them for their service at the airport - and it's definitely not just about how we observe the national anthem. Michael told me that our veterans need real action. They need real help with medical services, and access to jobs, and readjusting to society. At almost every turn our conversation took, Michael found some common ground: from talking about how he's a Warriors fan (good, good, I like it), to - way more importantly - pointing out how most of the issues that military vets face at home are actually the same as the issues faced by a lot of America. Homelessness, unemployment, mental health and, yes, racial inequality - those are the issues that our vets are facing. These are mostly universal issues, which are being felt in every town in America. 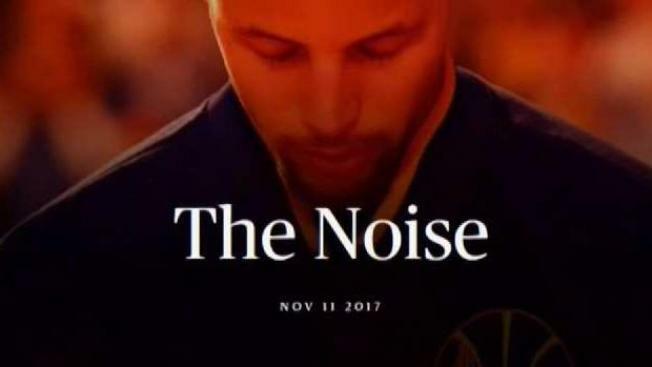 Wrapping up his article, Curry looked to make his message clear by writing, "Let's use our platforms, and take this day, to talk about how we can be louder than all of this silence - and quieter than all of this noise."